Recently, Google finished unveiling its latest ’social innovation’ at an event held at their Mountain View Headquarters. Google Buzz! Social Networking is clearly the buzz word on the Internet and with Orkut, OpenSocial struggling to keep up with the likes of Facebook and Twitter, Google is looking to this new product to match them. Given that mobile web is that other exciting area, Buzz has been developed with a strong mobile element. Gmail already has a huge user base about 176 million unique visitors per month (source:comScore) and Google is cleverly tapping into this base by adding Buzz to Gmail. When it is eventually rolled out to everyone, you will see a Buzz just below Inbox. Like any other Social Network, Buzz is essentially a stream of updates. Except that is not limited to status updates alone. It supports Inline video viewing and Images as well. 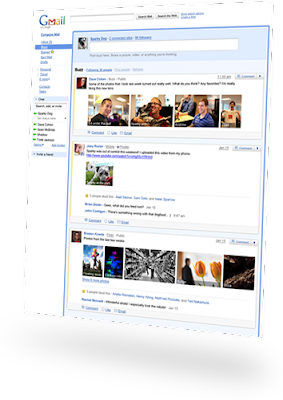 It also takes advantage of the open web and can link up with Google Reader, Picasa, Flickr and Twitter. It does not yet allow you to update Twitter, but Google hinted that this may be possible in the future. Privacy options can be set to share your updates with everyone or to a select group of people. Buzz aims to make your life simpler by auto-following people you interact with regularly over email/chat. Only drawback here is it can end up following people who may not necessarily be on your social radar (your Boss?). Google’s mission is ‘to organize the world’s information’, so why should the Social Web be an exception? It is believed that Buzz will filter(autohide) content that does not get commented on, thus only showing you the ‘good stuff’. For updates that do get commented on, Buzz makes sure you wont miss out anything thanks to real time updates and email alerts. It also allows you to reply directly from your inbox. You can direct comments at someone by using @ tags, and they will be notified via emails too. Buzz also recommends updates from people you do not follow based on whether it thinks that a certain Buzz will interest you or not. It is hard to imagine any social feature succeeding without a mobile dimension and Google is certainly not taking any chances. It will be accessible from Google’s Mobile Website, Buzz.Google.Com (on Android and iPhone) and Google Maps. When you Buzz on-the-go you can add location tags to your updates(Foursquare checkins?) or even read what your friends have said about a place. This is different from Google Latitude in that it relies on Naming the place instead of its coordinates. Despite being a fairly decent collaboration tool, Google Wave suffered due its ‘perceived complexity’ hopefully Buzz will sidestep that problem. Buzz is a very ambitious project by Google. While it does seem to have all the raw materials(borrowed and not) that could go into making a great social tool, whether it delivers as a finished product, that can challenge Facebook, remains to be seen. comScore could give us the answer in a few months. Google is still in the process of rolling Buzz out in phases to Gmail users. So if you don’t see it yet. Patience! Google hopes that instead of conversing on Facebook, Twitter, or MySpace, you'll instead turn to Google Buzz for sharing status updates, photos, and videos. How will the search giant convince you to make Google Buzz your social network of choice? Here are four key features revealed today. The main way of accessing Google Buzz will be through Gmail. Below your inbox, there will be a tab for Buzz, allowing you to read status updates, photos, and video. The 40 people you converse with the most in Gmail and Gchat are automatically added as friends. Buzz updates also appear in your inbox if someone comments on your updates or comments, or someone directs a Buzz to your attention by using the familiar "@" symbol. Google brought up that familiar criticism of social networks, that no one cares if you ate a bagel or stubbed your toe. To compensate for noise, Google Buzz lets you like and dislike status updates, and learn over time whether to show or collapse status updates from your friends. It also looks for conversations outside your direct group of followers and adds them to your feed as recommendations. Photos from Flickr and Picasa and video from YouTube appear as thumbnails in Google Buzz. Click a YouTube thumbnail, and the video will expand to play inline. Click on a photo, and it'll expand to fill most of the browser window, with the rest of the gallery in a narrow strip along the bottom of the screen. If you post a link in Buzz, you'll automatically be able to append images and the headline from that Web page. Finally, you can pull in tweets from Twitter (but no Facebook updates) into Buzz. Unfortunately, you can't send your Buzz updates out to Twitter or other social networks. Google Buzz will be available as a mobile Web app, letting you dictate status updates by voice and geotag your posts. When looking on Google Mobile Maps, Buzz updates appear directly on the map, so you can read location-based updates. You can also look for any recent Buzz updates posted near your current location. With each update you send, you'll have a choice of making it private or public. Private updates can go to all of your Buzz followers, or just a select group. Public updates are posted on your Google Profile page and are immediately indexed for Google Search.